Suzie sees the shadow lumber past the open window. Is this Mr Smith, the new neighbour? She has knocked in vain on the door of Number Two, where she has heard a Mr and Mrs A. Smith have just arrived. She had wondered if they wanted any help. But neither has been seen outside the house. Does Mr Smith work from home? Does Mrs Smith shop by mail order? No car stands in the freshly gravelled drive. No lawn mower appears on the grass, already too long for the neat expectations of Acacia Drive. Suzie creeps to the window and peers through. She is astonished to see exotic stained glass, choice ornaments and rich carpets, conjuring an eastern indulgence in suburbia. Then she sees him; an ape at least seven feet tall, plodding between a glass-topped table and a cabinet filled with fine glass. Suzie gasps. The creature, covered in thick brown hair, is trying to avoid the furniture, but bumps into a rosewood chair which tumbles over with a thud. Suzie flees, fearing she is having an hallucination. “Do you know anything about the people at Number Two?” she asks a neighbour, reluctant to reveal what she has seen. Fancy dress! That was what she had seen, decides Suzie. They were going to a fancy dress party. She thinks no more about the Smiths. But one windy morning she sees Mrs Smith in the garden, rooting around as though looking for something to eat. There have never been vegetables at Number Two, thinks Suzie. What is she looking for and why is she still in that ape suit? Perhaps the central heating is not working and it is a way to keep warm. The ape shambles back indoors. Suzie cannot resist another look. She creeps to the window again. Now she can see Mr and Mrs Smith in the plush front room. They sit on the sofa, holding hands and grunting. Suzie is about to withdraw, when Mr Smith spots her and lumbers over to the window. Before Suzie can retreat he has opened the front door. He stands still, staring. “H-hello!” ventures Suzie, “Did you go to a fancy dress party?” Mr Smith puts his head on one side and frowns at her from under heavy brows. “Is your heating not working?” Suzie tries her second theory. Now Mrs Smith, wearing a strange little hat, joins her husband. Both blink stupidly at Suzie. She seizes on another explanation. They are retarded. A backward couple invited to a fancy dress do, whose heating is kaput…..Suzie turns to run. But Mr Smith grabs her arm and draws her into the hall. The front door bangs behind her. Suzie takes a deep breath and decides to take a brave stand. “Can I help you with anything?” she asks. No response. Deaf-mute retards, who went to a fancy dress do and came home to find their heating defunct…..? By this time they are in the kitchen; a mass of modern gadgets, waiting to dispel domestic drudgery. Suzie sees a pile of green stalks in the sink. She picks some up and shows Mrs Smith how to put them in the rubbish bin. Mrs Smith repeats the action. “That’s right. Well done!” Suzie hears her voice echo among the shining utensils. She nods and smiles. “Shall I show you how to boil eggs?” she asks. No response. “Wait!” She leaves the kitchen, opens the front door and runs like lightening down the drive to her own house opposite. Her husband Clive is at work and she collapses, almost hyperventilating, in his easy chair. How did they come to rent the house? They cannot be real. Then minutes later, to her amazement, she goes to the kitchen and takes four eggs from the fridge. She slips these into a paper bag and makes her way back to the Smiths. She rings the bell. Mr Smith peers from the window, sees her on the step and opens the front door. “Eggs!” she says, holding up the bag. Uncomprehending, the Smiths follow Suzie into the kitchen. She fills a saucepan with water, pops in the eggs and turns them on to boil. The apes peer closely, apparently taking this in. When the eggs are ready, Suzie takes them out with a spoon and places them in the egg cups she has spotted in the cupboard. She hands the apes teaspoons, then takes Mrs Smith’s and shows her how to crack and eat the egg. The apes hold the spoons lightly in their clumsy hands and soon finish eating. “Now to wash up!” says Suzie. She shows them how and Mrs Smith takes the clean egg cups and washes them again. Suzie nods approval and notes the dirty carpet. She looks for a cupboard that might hold a hoover, finds it and switches on, pushing the machine over the oriental pile. The apes, afraid of the noise, clap their hands over their ears, but when Suzie switches off, both rush to switch on again and take it in turn to re-hoover the carpet. “Where are your clothes?” asks Suzie, deciding that washing is next on the agenda. No response. She searches upstairs but finds nothing. She shivers. Surely they cannot be for real? Did they escape from Regent’s Park? She tiptoes downstairs and sees Mr and Mrs Smith boiling water again without eggs. Once more Suzie runs like the wind back home. She says nothing to Clive when he comes back at seven. But he remarks that the grass at Number Two is growing too long. Perhaps, after all, it was an hallucination, thinks Suzie. She will have a medical check-up. The next morning she is about to ring the doctor for an appointment, when she has the irrational urge to return to Number Two. That lawn must be mowed and Mr Smith should do it. 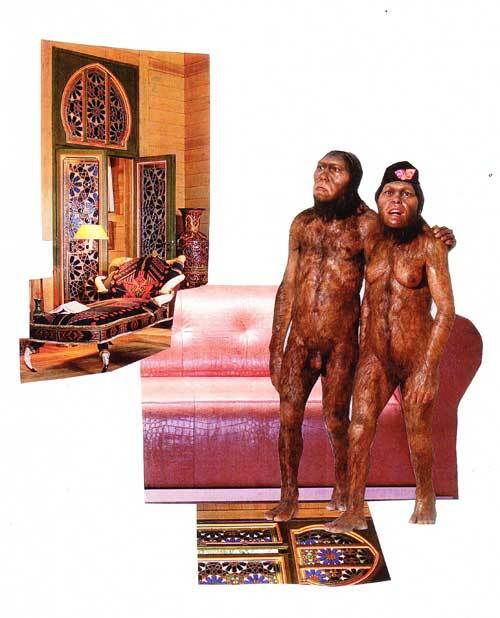 She finds the apes sitting, again holding hands, in the front room. “You must mow the lawn!” she tells Mr Smith. She takes his huge hand in hers and leads him to the garden shed. She points to the mower and starts to pull it out. He helps her. She finds a power point and starts pushing the mower through the thick grass. “Now you!” she says. The ape takes over, trundling up and down three times. Mrs Smith watches from the doorway. Suddenly she utters a shrill cry of distress. Suzie, who has been noting the borders need weeding, swings round, to see Mr Smith writhing and grunting on the grass. The mower has run over his left foot, slicing off two toes. Horrified, Suzie hurries into the house, finds the phone and dials 999. Mrs Smith lurches to her husband, groping him in helpless distress. Within half an hour the ambulance arrives. Mr Smith now lies in a coma and Mrs Smith is crouching beside him with glazed eyes. On seeing them, the medics halt, dropping the stretcher. “It’s Mr Smith. He’s had an accident!” explains Suzie. The men look incredulously, from her to the apes and, leaving the garden, rush to a public phone box to contact a vet. “Good heavens! Looks like he mowed some of the lawn first though. Perhaps you could finish it off before the new tenants arrive!” suggests Suzie.